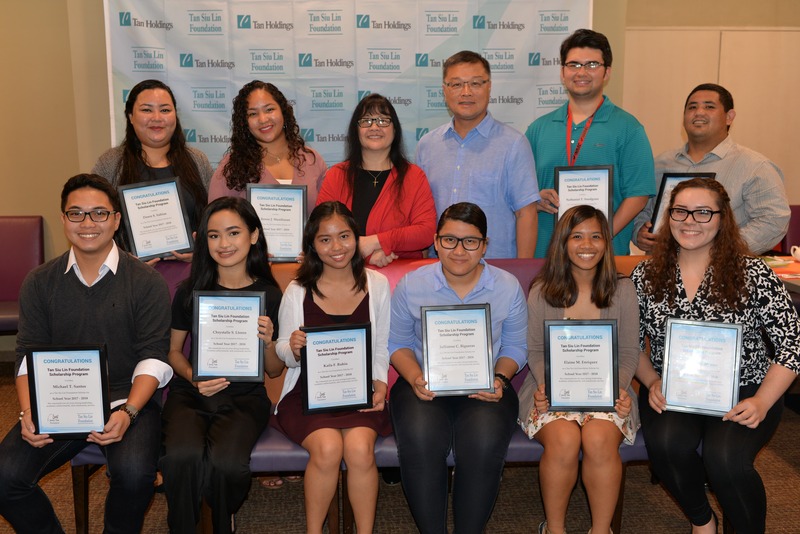 To emphasize its commitment to expanding higher education opportunities for CNMI students, the Tan Siu Lin Foundation recently awarded $10,000 to Northern Marianas College students who are pursuing their college degrees. The award was made as part of the TSL Foundation�s Scholarship Program, which has been awarding $10,000 to NMC students annually for ten years. From a highly competitive selection process, the following NMC students were selected to receive $1,000 each this year: Jullianne C. Bigueras, Elaine M. Enriquez, Brianna C. Hunter, Chrystalle S. Lloren, Renee J. Manibusan, Thomas A. Rabago, Kaila F. Rubio, Dawn S. Sablan, Michael T. Santos, and Nathaniel T. Snodgrass. The students are pursuing their degrees in Education, Liberal Arts, Hospitality Management, Rehabilitation and Human Services, and Accounting. "For more than 30 years residents have been looking to the Northern Marianas College for their professional and personal growth, " said Tan Holdings President Jerry Tan. " We are glad that we are able to assist many of these students by providing the TSL Foundation Scholarship. We will continue to support NMC and its students in every way we can." The Tan Holdings Foundation was formed in 2002 and was renamed after the company's founder and chairman, Dr. Tan Siu Lin. Through the years, the Tan Siu Lin Foundation has launched initiatives and built trusted partnerships with a diverse array of individuals, families, corporations, nonprofit organizations, and government agencies. The TSL Foundation's main mission is to better serve the regions where it operates to make such communities a better place to live. The scholarships are based on merit and are awarded on the basis of the candidate's community involvement, academic background, and letters of recommendation. The written essay also plays a key role in the final selection of scholarship recipients. The selection committee was composed of representatives from Tan Siu Lin Foundation and Northern Marianas College.